The scene of the deadly fight in downtown San Diego's Gaslamp Quarter on June 15, 2014. Opening statements signaled the beginning of a trial Wednesday for a San Diego gang member accused of sucker-punching a man during a fight in downtown’s Gaslamp Quarter, leading to the man’s death. The victim’s family members filed into the courtroom for the trial of Mahad A. Ahmed, 24, who is facing a murder charge in the killing of Michael Beaver, 25, as well as one count of assault with force. According to San Diego police, Beaver was found unconscious on a sidewalk at around 1 a.m. on June 15, 2014 in the 500 block of F Street, suffering from blunt force injuries to his upper torso. He later died from those injuries at the hospital. Police charged Ahmed with the murder one month later. 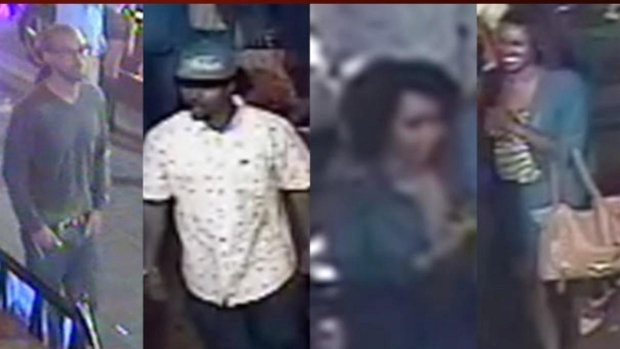 Investigators believe Ahmed and Beaver got into an altercation on the street that ended with Ahmed fatally sucker-punching Beaver near two downtown bars, Maloney’s and Encore. Police said both men had gone out with their friends that night, and at least three people were with Ahmed at the time of the deadly fight. A deputy district attorney said Ahmed allegedly delivered a fatal blow to Beaver’s head after his group of friends got into a dispute with Beaver. It began with a woman slapping Beaver in the face, then another man punching him and finally Ahmed running up and punching Beaver on his head, the prosecutor said. The prosecutor said a witness heard Beaver’s head strike a metal rail as he fell from the sucker-punch. Ahmed was linked to the case while already in custody for an unrelated incident. The prosecutor said Beaver’s blood was found on the defendant’s shirt. After Ahmed was linked to the killing, the case was turned over to the San Diego County District Attorney’s Office. Ahmed has been in jail since June 2014 awaiting trial. Beaver’s brother and father attended the trial Tuesday. As NBC 7's Sherene Tagharobi reports, it's been a difficult few weeks for Michael Beaver's friends and family since he was found unresponsive on the sidewalk outside this bar. The brother – who was out with Beaver on the night of the fight – described the altercation on the stand. He said he was still in shock over his brother's death and will never understand it. The brother said he, a friend and Beaver had stopped into Maloney's, Double Deuce, Coyote Ugly and McFadden's before the fatal fight. A surveillance video that captured the fight was shown in court. It showed Ahmed delivering the deadly blow and Beaver staggering around trying to regain his balance after being punched.